In Spanish they’re called the “plátano macho.” In English: plantain. The literal translation from Spanish to English is pretty spot on: macho banana. A big, manly banana with bravado. The King Kong of the starchy, golden fruits. They’re also macho intimidating. As big, starchy, and cumbersome as they are, I’ve really never done anything with them beyond what I’ve seen friends do. My beautiful friend Madeline taught me how to fry them up for a Guatemalan breakfast with refried black beans…mmmm!!! But they should really be incorporated into our diets more easily and without nutritional compromise. So, with this recipe (and future recipes) I hope to demystify some of the intimidation and fear surrounding the enormous beasts and give them an every day application. Found throughout West African, Caribbean, and Latin American cuisines, the plantain is a member of the banana family most commonly used as a vegetable. It is much larger, starchier, and thicker skinned than a normal banana and has a huge variety of uses. Plantains have a distinct taste throughout every phase of its ripening and morphing from bright green to black in color. 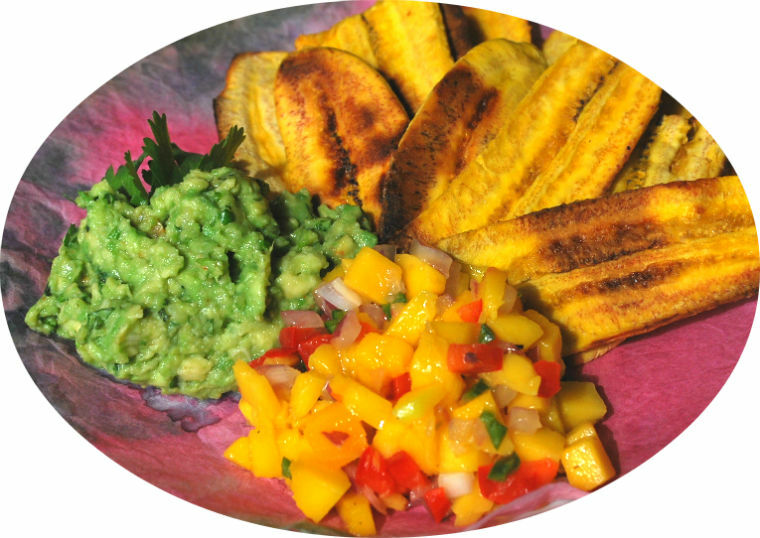 Plantains are nutritional workhorses and strut around providing loads of potassium, magnesium, phosphate, and fiber. They are also an excellent source of vitamins A, B6, and C. Because of its firm texture, it is excellent when fried, boiled, or baked and takes on a sweet, but not decadent, flavor. The complex carbohydrates in this starchy fruit also are an excellent source of energy for athletes and for anyone looking to stay and feel full to power through the day. Added bonus? Plantains are available year-round in most grocery stores. Delightful on their own, these baked plantain chips rise to an even higher level of snacking ecstasy when accompanied by a fresh and simple Mango Salsa and savory Roasted Garlic Guacamole. And now that it’s football season (the NFL is extremely popular in Mexico! Aiyyeee! ), cheer on the best team in the history of the universe (aka the Green Bay Packers) with a colorful, nutrient rich, and mouthwatering alternative, or addition to, the perfunctory processed snack foods. Might I also suggest a certain Chipotle Black Bean Salsa and Baked Tortilla Chips for the next tailgate? Note: All proportions of recipes can be easily multiplied. Heat oven to 375 degrees. To prepare the roasted garlic, cut off the top of head of garlic about 1/4th of the way down to expose the cloves. Drizzle olive oil evenly over the cut garlic, wrap in aluminum foil and roast in oven for about 30’’ or until perfectly golden brown and soft to the touch. 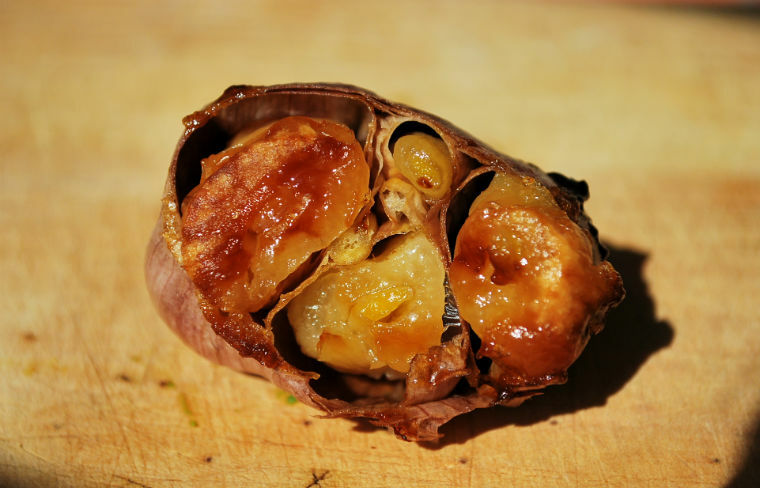 The right roasted garlic cloves should just be nearly jumping out of their paper casing, soft and succulent. 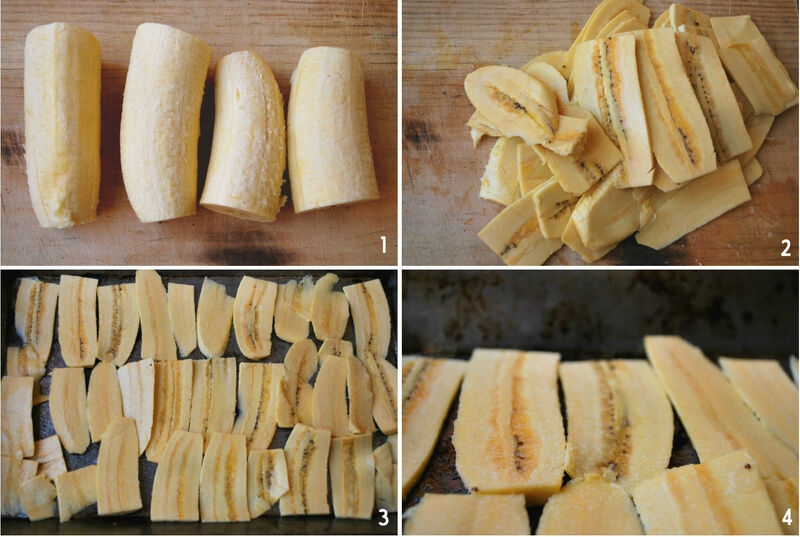 Slice plantains for baking. Peel the plantains and chop in half lengthwise (1). Hold them horizontally on cutting board and slice to uniform thickness, using caution with your knife since their starches get slimy and slippery (2). Spritz baking pan with olive oil (vegetable oil is fine as well). Arrange plantains on baking pan and spritz again lightly with oil (3). Sprinkle with table salt and bake for 10-20” until golden brown (4). 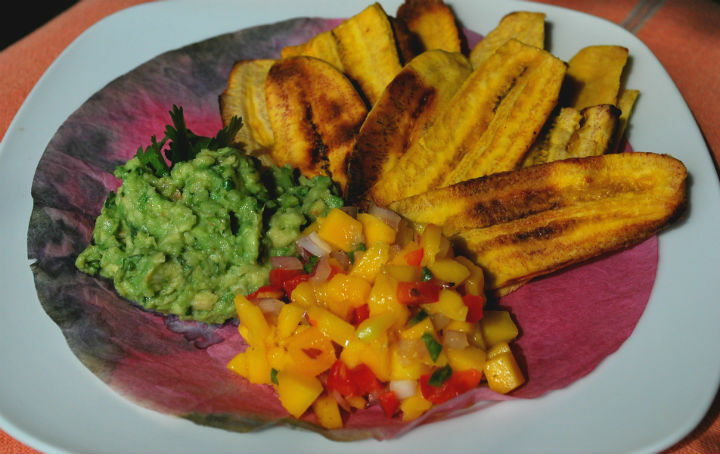 Peek on the chips often and remove pieces of plantain that bake faster than others. I found that on the first round I had half my chips burnt through and the other half underdone. So the key here is uniformity and vigilance! 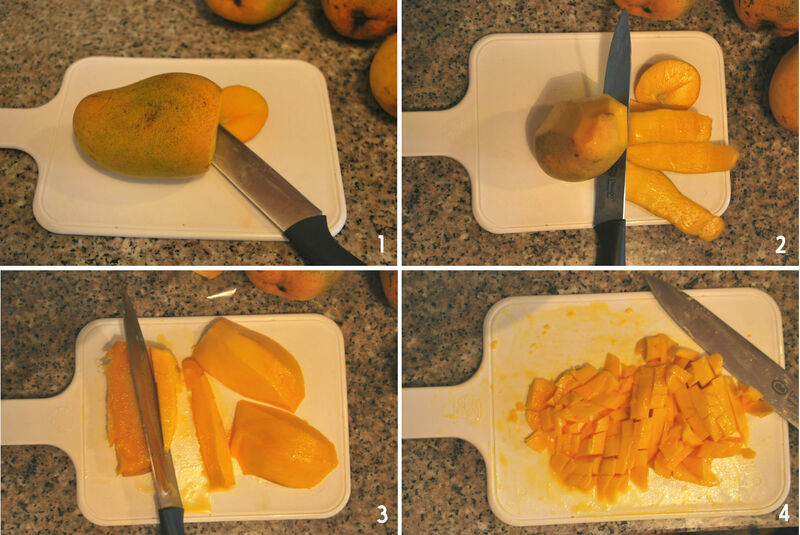 1) Cut a thin slice off the bottom of the mango (where the stem is) to create stability. Cut a small tip off the top of the mango as well to help get you started. 2) Turn mango horizontal on cutting board. Staying as close to the peel as possible, make long slices from top to bottom of the fruit. It’s as if you were filleting a fish. Worry not if on the first few tries you cut off too much fruit, for the meaty peel slices make an excellent snack later in the day. 3) Once the entire skin has been removed, maintain the mango horizontal and, using your knife and with a steady grip, gently test the flesh to find the long oblong seed and slice down along the seed to the bottom of the fruit. You should end up with a nice chunk of fruit. Repeat on the otherside.Cut gently around the seed to release the extra fruit clinging to the sides of the seed. 5) Slice and dice as normal. Once your roasted garlic has cooled enough to the touch, gently release the cloves into a small bowl. Avoid slathering on fresh bread at all costs. In fact, go brush your teeth to avoid this. 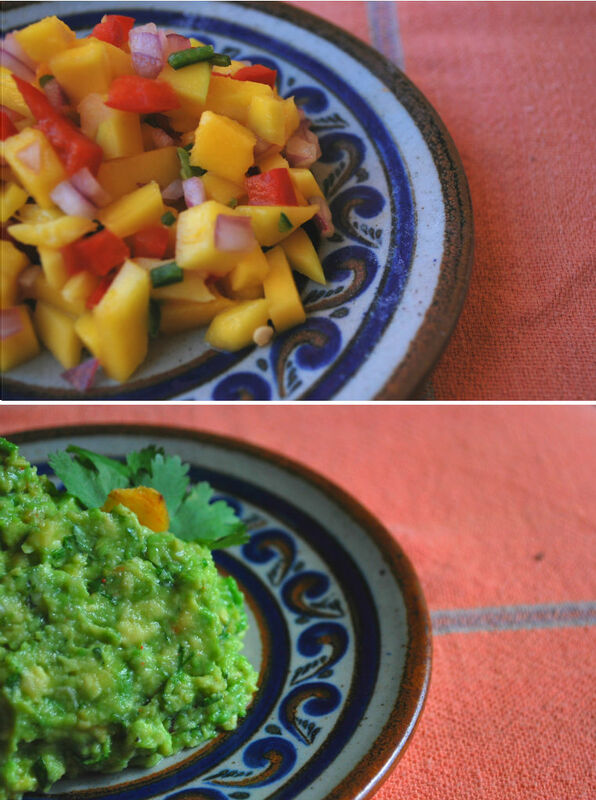 Add avocado and finely chopped cilantro to bowl. 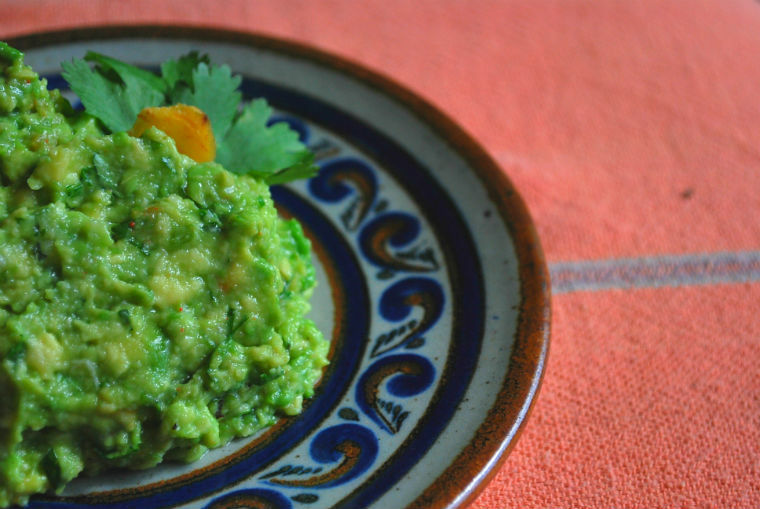 Mash together with a fork and season to taste with salt and lime. Pat yourself on the back for being such a genius in the kitchen. 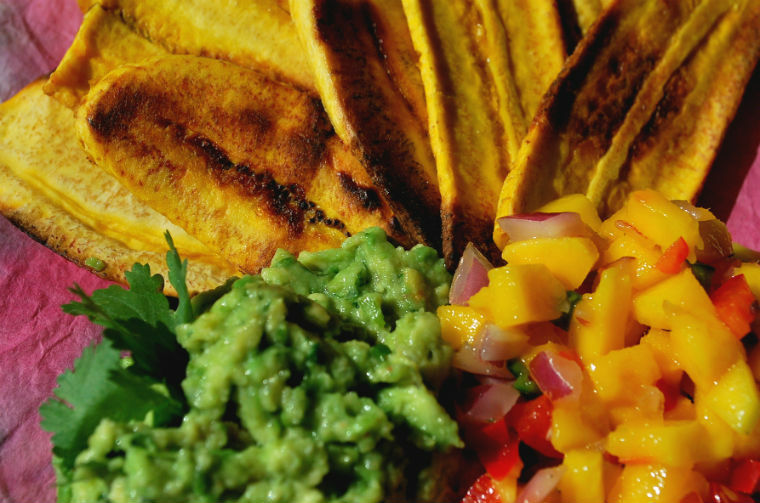 Now, all there is to do is wait for the plantain chips to cool and you have yourself a most delightful, colorful, and nutritious spread. I obviously devoured all of this on my own over a couple of days, but be a pal and share it with your loved ones. Cheers and Go Pack! baked plantains!! I am going to try that! when i first bought them years ago….i ate one like a banana! didnt really like it! i will definately try again! thanks for your creativity and inspiration!